One of the HR industry’s leading research firms is out with their annual report on trends in corporate wellness programs, and once again employee financial wellness is the top initiative for employers. For the third year running, Aon Hewitt’s Hot Topics in Retirement and Financial Wellbeing found that helping workers with their financial wellness in ways that extend beyond retirement is the priority for many companies. About half of employers (49%) are still getting their full strategy off the ground, but most are already offering some mix of tools, services and education around financial issues. Fifty-eight percent already have a tool available to help with at least one aspect of financial wellness, and the number who plan to add one this year could raise the share to 84%. A high majority (86%) are sharing a key message with their workers: the link between health and wealth. As more employers add financial wellness programs to their benefits offerings, it’s worth asking what’s behind this movement. Let’s look at the top six reasons employers gave for making it a top initiative for workers. A really high share of employers are adding financial wellness for one simple but powerful reason: because they believe it’s the right thing to do. And the fact that doing the right thing was the top motivator makes a lot of sense when you think about it. After all, the same people who help your company earn profits and achieve great things in the marketplace shouldn’t have to worry all the time about money. It’s clear that most employers believe it’s time to help their teams with a program that improves financial wellness. Coming in a close second is the hope of increasing employee engagement. Nearly four out of five companies believe a successful financial wellness program would get their teams more focused and productive on the job. And guess what? That hunch has been confirmed by separate research from the Society of Actuaries. They revealed in 2017 that among companies where financial wellness was improving, unplanned worker absences dropped by 24.6%! (2) How’s that for a compelling reason to add a financial wellness program? We told you companies are focused on helping workers with wellness in ways that extend beyond retirement. But that doesn’t mean they’ve forgotten about the question entirely—far from it! In fact, three out of five companies said improving their teams’ retirement numbers was a key reason for creating or expanding a financial wellness program. Trying to minimize 401(k) leakage. This is another area in need of some big improvement, and one where the right financial wellness program can help. 401(k) leakage is what happens when employees take money from their retirement accounts to cover living expenses or emergencies, often with huge penalties and tax payments. What’s more, every time this happens the employee is unplugging from years of potential compound interest growth. Increasing participation. Obviously no one is going to be ready to retire if they never even enroll in your company’s plan. Many companies want to get more of their team investing, and a great financial wellness program can make that happen. In case you haven’t noticed, employees these days often find themselves distracted from work by money trouble. Another Aon Hewitt report, the 2016 Financial Mindset Study, found that 49% of workers acknowledge they spend time at work dealing with personal finances. No wonder then that most employers who want to offer workers a financial wellness benefit agree that a big reason is in order to help their teams spend fewer work hours handling personal finance issues. Spending less time dealing with bills on the job is a financial win-win for both companies and workers, and it’s yet another great reason to find the right benefit for your own business. Imagine learning someone on your team lacked the financial means to make the right decisions for their health—you’d probably do anything in your power to make that right! Sadly, this is a situation that’s all too common for American workers. 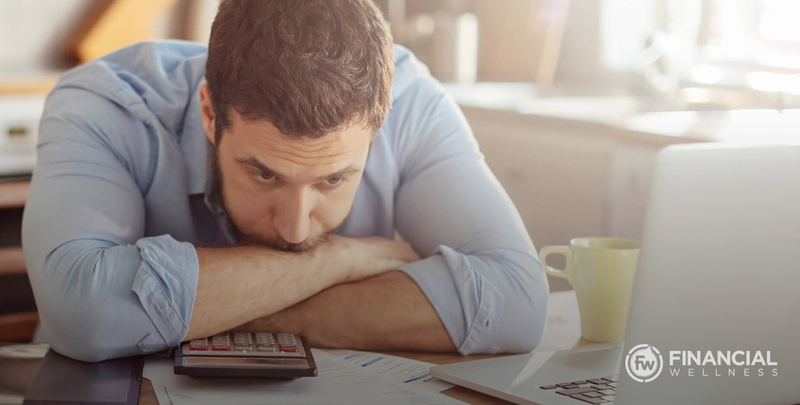 And there’s no doubt that money troubles can adversely affect employees’ physical health, impacting both their families and their workplace. Research from Bankrate Money Pulse indicates that 25% of Americans say either they or someone in their family has skipped needed medical care because of the cost. (4) That’s a sad stat, made all the worse when you consider that stressed-out workers who skip necessary checkups are much more likely to miss work. While decreasing medical costs ranks a bit lower as an incentive for companies to add financial wellness, it’s still a goal well over a third of respondents have in mind. You need a financial wellness solution that helps workers see the vital need for emergency savings and insurance coverage that will protect their health and wealth. More than a quarter are in the habit of saving none of their monthly take-home pay. Almost three-quarters are in debt, and most believe they always will be. Those numbers illustrate exactly why workers are looking to their employers for some guidance into better financial outcomes. After all, your company and others are their source of income! Any of the above reasons is sufficient on its own to implement the right financial wellness program, but taken together they make for a no-brainer. It is possible to see improvement not only in the personal finances of your workers, but also in your company’s bottom line. Ready to learn more about how real financial wellness can transform the lives of your employees and grow your business? Find the tools and resources you need to become the financial wellness expert at your company!